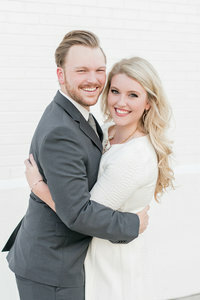 Emily and Will had a beautiful Huntsville, Alabama wedding day. It rained nearly all day, but Huntsville Botanical Gardens served as the perfect setting for rainy day photos. The gorgeous patio with stunning white columns let all the natural light in, but shielded our couple and their family and friends from the weather. Then, the skies cleared just long enough for us to capture some portraits in front of the beautiful purple doors at Huntsville First Baptist Church – the very doors where Will asked Emily to be his wife! We couldn’t go without photographing those! Emily is the epitome of classic beauty. Her dress was absolutely stunning, and paired with the light blue bridesmaids dresses and the white blooms, it was perfect! Will was so dapper in his black tux, and we loved watching the way he looked at Emily all day. These two were high school sweethearts, and even though they took some time apart in college, all their family and friends kept saying was, “they only ever had eyes for each other.” That was so evident in the way they looked at each other. Like they were the only two people in the room, amidst their 300 closest family and friends. It was beautiful to watch! Mr. and Mrs. Crosby, your day was a dream, and we consider ourselves so lucky that we got to be a part of it! Thank you for your kindness and your friendship and for allowing us to capture the memories from a day that we will never, ever forget! Congratulations, you two!! We love you guys!